2015 is just around the corner, and at BBJ we could not be more excited! Mark your calendars and call us to reserve your spot for these exciting upcoming events! Mid-Late January Moving to our new space at 823 St. Andrews Blvd. in West Ashley! 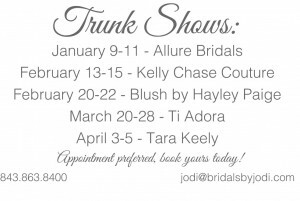 What’s a trunk show you ask? A trunk show is when a designer sends us dresses from a collection that we currently do not have sampled in the shop. The dresses are just shipped in for a few days and only available to the brides that try them on that weekend! Special Trunk Show discounts are also offered. All in all, it makes for a fantastic weekend to gown shop! Appointments are definitely recommended as they guarantee you a fitting room and a dress consultant! 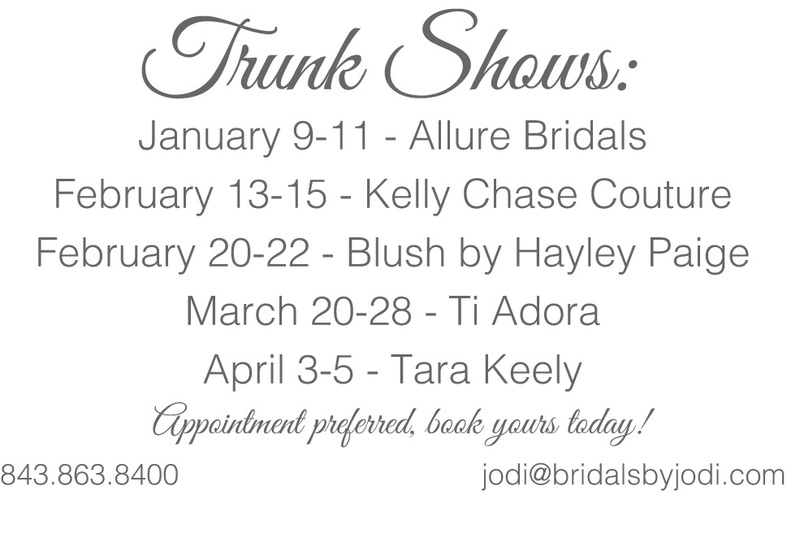 Call or email us to book your appointment. It may or may not come as a shock to learn that wedding gowns are available in a wide range of colors. Long gone are the days of strictly wearing a white wedding dress. 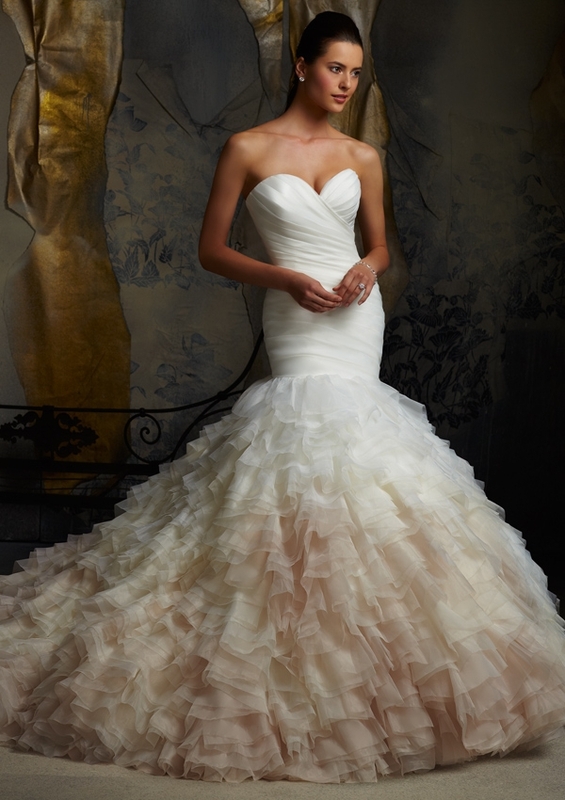 Gowns are available in white, ivory, café, and blush just to name a few. So, with so many color options out there, how do you choose the right one?? Well, there are a couple things to keep in mind. 1. Consider your skin tone. Shopping for everyday clothing has probably already given you a heads up about what looks good on your body. If you are fair-skinned, consider an ivory gown with a yellow or golden undertone. For medium skin tones, look for a gown that has creamier undertones. If you have darker or olive skin, try that bright white or even a blush gown. 2. Consider the season. For the Spring bride, stick with a softer ivory or blush; with all the blooms around you, you’ll stand out in your gown. Summer brides can benefit with a gown in a yellow undertone. For the brides tying the knot in autumn, try something a little darker-a gold or café. Winter brides can play on the colors around them; white gowns and those with silver accents are beautiful this time of year. 3.Consider your personality. Are you a traditional bride, who always dreamed of wearing white on her big day? Go for it! Are you a little more adventurous? Try a blue or ombre. Want something classic, but white isn’t for you? Then perhaps ivory or gold is right for you. All in all, the choice is yours. Remember, not all designers and gowns are available in color options. Do some research before shopping and ask questions when you go to your appointment. 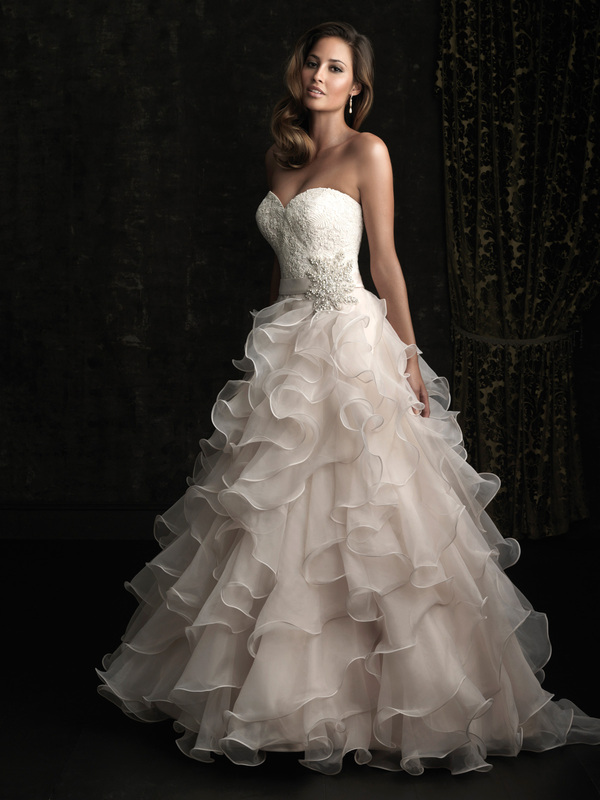 Wear what makes you feel beautiful and like a bride!